A company that sells official National Football League apparel has sued Facebook for allegedly displaying ads for counterfeits. "Facebook has failed to take any measures to curb or stop the placement of fraudulent and illegal ads on its website, opting instead to grow revenues by adding additional counterfeiters each day to its roster of advertisers," Krystal's NFL Shoppe alleges in its complaint, filed this week in U.S. District Court in New Mexico. The company is seeking to bring a class-action on behalf of all retailers and wholesalers of official NFL clothing. Krystal's argues that Facebook is more than a "passive party" to the ads because the company allegedly "employs sophisticated data mining technology to assist the counterfeiters." Specifically, Facebook allegedly helps the counterfeiters to target ads to the same users who might otherwise buy the official products. In some cases, ads for official, relatively pricey, football jerseys are shown on the same page as ads for the far cheaper fakes, Krystal's alleges. "If consumers believe -- albeit mistakenly -- that they can order an official NFL jersey for $22, as opposed to the [manufacturers' suggested retail price] of $100 -- they will understandably choose the cheaper jersey," Krystal argues. "A material part of the willingness to click on such ads may be the credibility that is provided to the counterfeiters via their association with Facebook." Krystal's also named ad shop adSage and ecommerce company DHGate.com as defendants. Krystal's alleges that all companies are violating the federal false advertising law as well as a New Mexico unfair practices law. A Facebook spokesperson says the case is without merit and that the company will defend itself vigorously. Other Web companies sued for displaying problematic ads have had mixed results in court. The ad network AdKnowledge recently lost a bid to dismiss a lawsuit alleging that it duped consumers by helping to develop deceptive online ads. In that case, U.S. District Court Judge Denise Casper ruled that dismissal before trial would be premature, because AdKnowledge allegedly "partnered" with companies that lured users into signing up for paid memberships in poster clubs. Those clubs sent members two posters every month for a $29.99 recurring fee. But Google defeated a lawsuit in 2009 alleging that the company displayed fraudulent ringtone ads. In that case, U.S. District Court Judge Jeremy Fogel in San Jose ruled that the federal Communications Decency Act immunizes Google from liability for pay-per-click ads created through the AdWords platform. The Communications Decency Act says that Web companies aren't liable for how their platforms are used by third parties. That law doesn't immunize Web companies from intellectual property claims, but Krystal's didn't specifically accuse Facebook of infringing trademark or copyright. 1 comment about "Facebook Sued Over Ads For Fake NFL Jerseys". 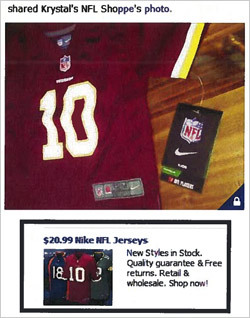 Robert Repas from Machine Design Magazine, October 25, 2012 at 12:50 p.m.
And how does Krystal's suggest Facebook determine whether the company buying these ads is selling real or fake NFL jersies? For all we know, Krystal's might be a forger complaining that they can't get top money for their knockoffs because the other knockoffs are selling more cheaply.